During her first semester of college, Vanessa Pratt decided she wanted to start a Mock Trial team at the University of Illinois Springfield. She went to work recruiting other students and found a faculty sponsor to help guide the team. The American Mock Trial Association assigns students a case each year. Students serve as either prosecutors or defense attorneys arguing the case, often before real judges or attorneys. The team competes against other universities throughout the state. Pratt, a sophomore legal studies and communication major from Quincy, Illinois, chose the University of Illinois Springfield because her father and uncle are alumni. On campus, Pratt is a member of the Capital Scholars Honors Program, Pre-Law Society, Model Illinois Government, the Christian Student Fellowship and works for UIS Admissions. She encourages other students to get involved. Following graduation, Pratt plans to attend law school and one day hopes to become a prosecuting attorney. She hopes Mock Trial will continue to grow at UIS. “I really hope it stays long after I’m here and it’s something I can come back as an alumnus and help out with and be able to tell people that I got that started,” she said. The University of Illinois Springfield is known for educating some of the state’s most effective public servants and that’s exactly why Peyton Bernot decided to earn his degree at UIS. At 21, the political science major is already applying what’s he’s learned in the classroom – as an elected official in his hometown of Benld, Illinois. Bernot is an alderman in Benld where he chairs the finance committee and oversees the city’s budget. He’s also a Gillespie CUSD #7 school board member. In 2011, Bernot decided to run for the school board and city council because he disagreed with many of the decisions being made by elected officials. He defeated incumbent opponents in both races to win. Two years later, Bernot decided to run for mayor of Benld. He lost the race, but says he learned a lot from the experience. “You learn more from losing than you do from winning and I think that’s served me well,” he said. Bernot is pursuing his bachelor’s degree at UIS to learn about the theories behind political science. He chose UIS because of its location in the state capital and abundance of internship opportunities. “I just recently completed an internship with the Illinois Petroleum Council and it was a great experience. Without UIS I wouldn’t have had that experience,” he said. After he graduates from UIS, Bernot wants to either earn his master’s in public administration from UIS or attend law school in Chicago. He knows the latter would mean giving up his political career in Benld. 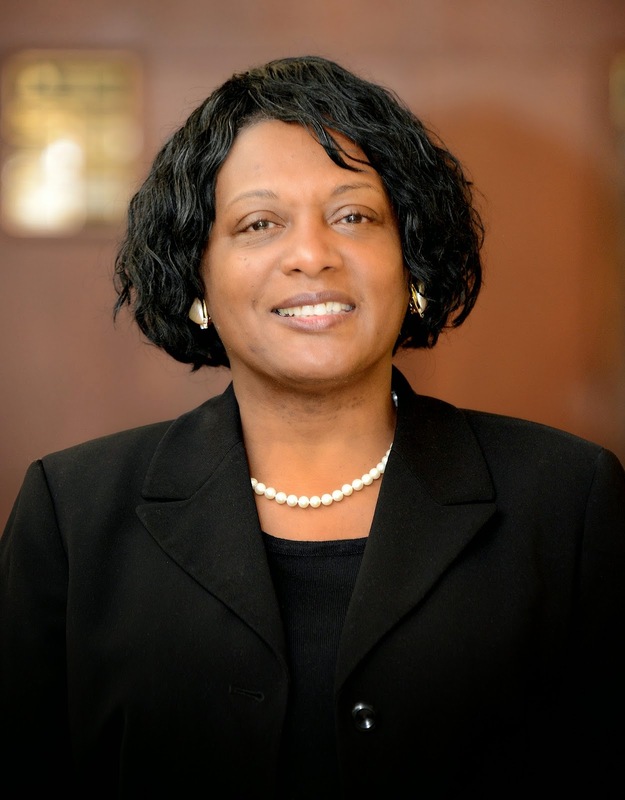 Clarice Ford, Ph.D., has been named the interim vice chancellor for student affairs at the University of Illinois Springfield. Her appointment began on Oct. 13, 2014. As Interim Vice Chancellor for Student Affairs, Ford leads campus departments, such as Admissions, Financial Assistance, International Student Services, Residence Life, and Student Life, which are critical to student recruitment and success. Ford has been a member of the UIS community since 2008 and previously served as Associate Vice Chancellor for Student Services and Executive Director of the Diversity Center. Ford came to UIS from Berry College in Rome, Georgia where she served as the Associate Dean of Multicultural Affairs. Previously, she worked at Youngstown State University and The Ohio State University in Student Affairs. Ford will serve as Interim Vice Chancellor for a two-year period with the appointment being reviewed on an annual basis. When Aerie Nguyen took the 30 hour flight from Vietnam to the United States she didn’t know what to expect. However, when she arrived at the University of Illinois Springfield she found a warm and welcoming environment. Nguyen quickly got involved on campus and is now the president of the Asian Student Organization, vice president of the International Student Association, and a chair member for the UIS student chapter of the Society for Human Resource Management. “I love it here so much. My experience here at UIS is wonderful as a student leader,” said Nguyen. She admits to being homesick at first, but that quickly changed when she realized all of the opportunities available to her on campus. That’s when she decided to get involved on campus, first with the Asian Student Organization and International Student Association as a member. After she graduates from UIS, she plans to work either in the United States or Vietnam. Aretha Hughes helps plan two of the biggest annual events on the University of Illinois Springfield campus. As traditions co-coordinator for the Student Activities Committee, she’s responsible for planning Homecoming and Springfest activities. The psychology major from Chicago is also vice president of the Spirit Team and a member of the Black Student Union. Hughes says attending UIS has taught her a lot of about leadership and has helped to improve her communication skills and her ability to work professionally with others. She enjoys her leadership roles on campus because they give her a break from academic work. After she graduates from UIS, Hughes plans to pursue a career in Clinical Psychology and wants to help youth who are in need. “I feel like once I get to the point where I’m done with school or done with doing things on campus that I feel like I’ll be ready,” she said. 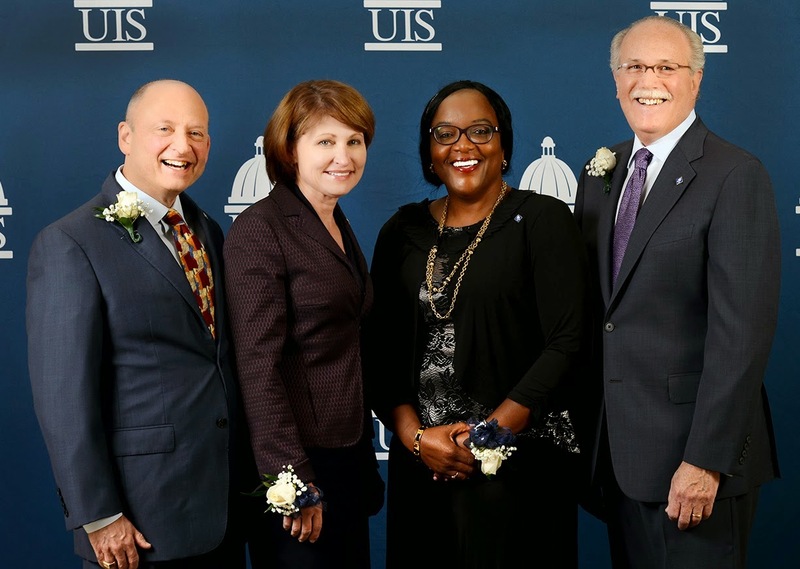 The University of Illinois Alumni Association honored the significant contributions of Ralph Blackman, William and Julie Kellner and June Agamah during the University of Illinois Springfield’s annual Alumni Gala on Friday, November 7, 2014 at the Abraham Lincoln Presidential Museum. The Alumni Achievement Award was given to Ralph Blackman, who earned a master’s degree in Public Affairs & Administration in 1976. Blackman is currently the President and CEO for the Foundation of Advancing Alcohol Responsibility (AAR). The award is the highest honor bestowed upon graduates of the University. It is given to those who have attained distinction and success in one’s profession or life work. Blackman said that when he was named to his current post in 1996, he knew it could be the most important position he’d ever hold in a career that included stints at the White House. The efforts of the Arlington, Virginia-based nonprofit have helped decrease alcohol-impaired driving fatalities by 32 percent since its inception in 1991. Prior to joining AAR, Blackman served as the associate director of the White House Conference on Small Business during the Reagan administration, and as the assistant administrator for private enterprise within the U.S. Agency for International Development during the George H.W. Bush presidency. Blackman also founded Public Access, Inc., a Washington D.C., corporate-relations firm that provided assistance to clients interested in business ventures abroad. The Distinguished Service Award for extraordinary commitment, dedication and service to the advancement of the University of Illinois was awarded to William and Julie Kellner. William Kellner earned a bachelor’s degree in political science from the University of Illinois at Urbana-Champaign in 1973, Julie Kellner received a bachelor’s degree from the UIS College of Business and Management in 1986. Whether through their own generosity and volunteer work or by generating community and corporate support, the Kellners have made invaluable, decades-long contributions to UIS and the region. The Kellners are Presidents Council and UI Foundation members, as well as generous annual contributing members of the University of Illinois Alumni Association. At UIS, they give regularly to the visual and performing arts programs and have endowed the Kellner Family Scholarship Fund, a needs-based scholarship. They are major benefactors of Memorial Medical Center in Springfield. Julie serves as the executive director of The Lincoln Academy of Illinois. William, along with Julie, is the third-generation owner of M.J. Kellner Co., a wholesale food distributor, and a director of National City Bank. June Agamah was honored with the Alumni Humanitarian Award for significant contributions of leadership or service to improve the lives of others and the welfare of humanity. June received her master’s degree in Public Affairs and Administration in 2001. She is a public health worker with the International Health and Development Network. Since 1996, June, along with her husband, has helped lead 25 mission trips to bring clean water, electricity and medical care to rural villagers in Ghana, West Africa, her husband’s homeland. In 2008, Agamah and her husband helped open a hospital for thousands of under-served villagers. The organization’s records show that it has helped tens of thousands of people in the past 18 years. A native of Guyana, South America, Agamah believes that monetary aid is vital to doing good work, but to effect change, the willingness of the human heart to serve counts even more. For more information on the awards, contact Chuck Schrage, vice president and association chancellor for alumni relations at 217/206-7395 or email schrage@uillinois.edu. 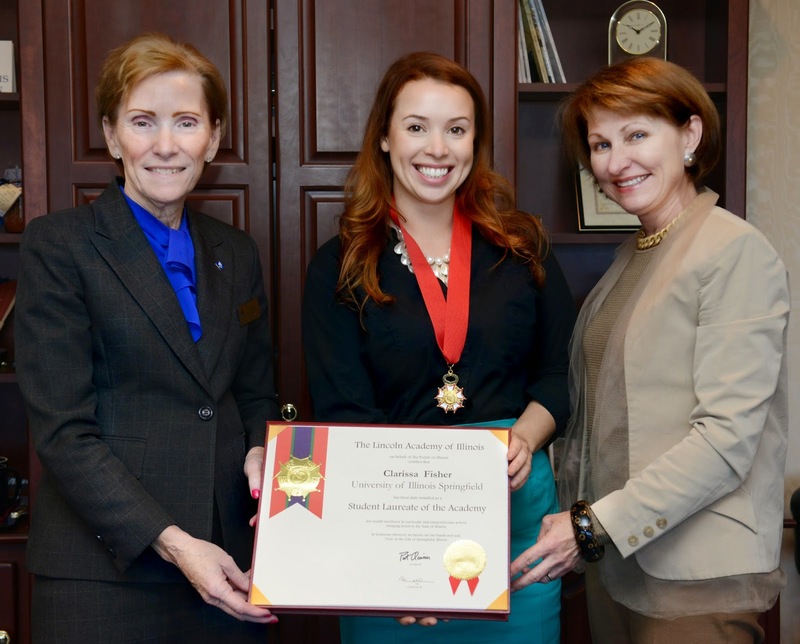 University of Illinois Springfield senior Clarissa Fisher has been honored with the Student Laureate Award from the Lincoln Academy of Illinois. Fisher, a Rochester, Ill. native, is majoring in Accountancy at UIS. She holds a 4.0 GPA and plans to take the CPA exam upon her graduation. Her plans also include pursuing a career in international financial management. “I look forward to taking all that I have learned at UIS and applying it to my CPA exam which will open so many doors professionally, though I will not forget the institution that made it possible,” said Fisher. Following a year in China teaching English and Art to elementary school students, and a subsequent mission trip to Haiti, Fisher found her passion for community service. She is involved with the Family Service Center in Springfield, the Boys and Girls Club of Central Illinois and Big Brothers Big Sisters - Illinois Capital Region. On campus, Fisher is active with the campus Accounting Society, Habitat for Humanity, and is on her way to becoming a LGBTQA Resource Office Safe Zone member and advocate. Fisher began her collegiate career at Indiana University – Purdue University Indianapolis and transferred to UIS. She was the recipient of the Transfer Student Scholarship. “Personally, I want to do well enough for myself that I can donate my time and efforts to giving others a chance,” said Fisher. Fisher says her education and experience serving others overseas is helping her carve a path to her future. For more information, contact Derek Schnapp, UIS director of public relations, at 217/206-6716 or dschn3@uis.edu. As a volleyball player at the University of Illinois Springfield, Carly Wesolowski has learned a lot about leadership on and off the court. The communication major chose UIS because of the personalized academic programs and the chance to play volleyball at an NCAA Division II school. At UIS, Wesolowski is also a member of the Capital Scholars Honors Program and often gives back to the Springfield community by volunteering. On the court, she has learned many lessons about leadership from her coaches and team captains. Wesolowski has a close relationship with her teammates, jokingly comparing them to a sorority, who is always supportive of their members. Being a part of a team has taught her how to work as a group and how to work with people. Following graduation from UIS, Wesolowski plans to work in public relations for a university or athletic program. University of Illinois Springfield Associate Professor of History Peter Shapinsky has published a new book titled Lords of the Sea: Pirates, Violence and Commerce in Late Medieval Japan. At UIS, Shapinsky teaches a popular history course titled, From Vikings to Hackers: A Pirate’s World History. 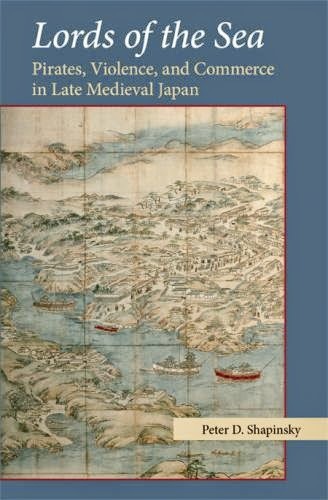 The book focuses on the perspectives of seafarers during Japan’s late medieval period, from 1300 – 1600. Though usually dismissed as “pirates,” these seafarers thought of themselves as sea lords. Over the course of several centuries these sea lords became maritime magnates playing key roles in the operation of networks linking Japan to the rest of the world. Their sea tenure practices spread influence across the waves and continent shaping commercial and diplomatic relations with Korea and China. During this time, Japan’s land-based authorities came to accept the “pirates” and even competed to sponsor sea-lord bands. Sea lords were then able to translate their medieval autonomy into positions of early influence in early modern Japan. Shapinsky's other work includes "Polyvocal Portolans: Nautical Charts and Hybrid Maritime Cultures in Early Modern East Asia" published in Early Modern Japan (2006) and “With the Sea as their Domain: Pirates and Maritime Lordship in Medieval Japan” published in Seascapes, Littoral Cultures and Trans-Oceanic Exchanges (2007). 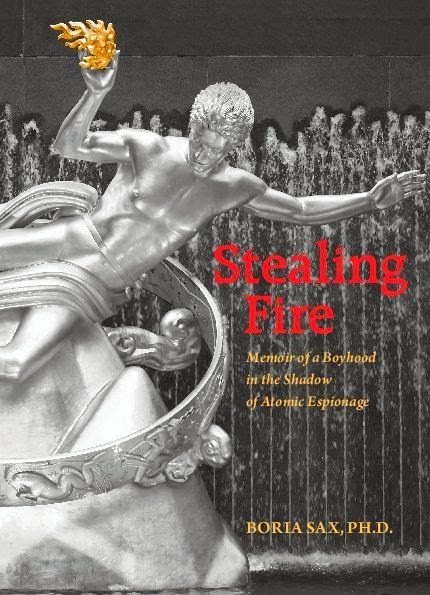 The book was published by the Center for Japanese Studies at the University of Michigan and is available for purchase online. As a freshman, Joseph McGee set a goal of becoming president of the Student Government Association (SGA) at the University of Illinois Springfield by his senior year. Thanks to his hard work and the opportunities available to him at UIS he’s achieved his goal. “I’ve always been an advocate for the students and trying to get things fixed and better for the student’s lives at the school, so when I found out they had SGA, I automatically wanted to be president before I graduated,” he said. McGee was selected by his fellow students to become SGA president following a campus-wide election. He’s also involved in Model Illinois Government, College Democrats, and the Black Male Collegiate Society. His involvement on campus has taught him many leadership lessons that will continue to benefit him in the future. McGee is a political science and legal studies major who is considering attending law school or becoming a U.S. Army Corps of Engineers Park Ranger following graduation. “This is something that I’m going to be going into, so it all prepares me,” he said. University of Illinois Springfield Associate Communication Professor Kathy Petitte Jamison has spent the past few months teaching and learning from Illinois to Missouri and across the Atlantic Ocean. Jamison served as a guest lecturer at Vellore Institute of Technology in Vellore, India this past summer. She taught professional and research writing to doctoral students and faculty, at times speaking to lecture halls holding 600 participants, all eager for insight into good writing skills in English. Jamison was also chosen to participate, along with 43 professional photographers from the U.S. and 13 other countries, in a workshop offered by the University of Missouri-Columbia photojournalism school. The Missouri Photo Workshop has documented small town and rural life in Missouri towns for 66 years. The group was sent to Platte City, Missouri to find a photo story to follow for a week. Jamison chose to highlight the town’s social gathering place called The Pool Hall. See her photo documentary here. Jamison’s experience abroad and in the photography workshop are part of her UIS sabbatical. Sabbaticals have been documented as important in higher education because they serve to promote professional development by providing opportunities for reflection, artistic creation, research, innovation in teaching and professional exploration. Harvard University was the first to develop a sabbatical program in 1880. 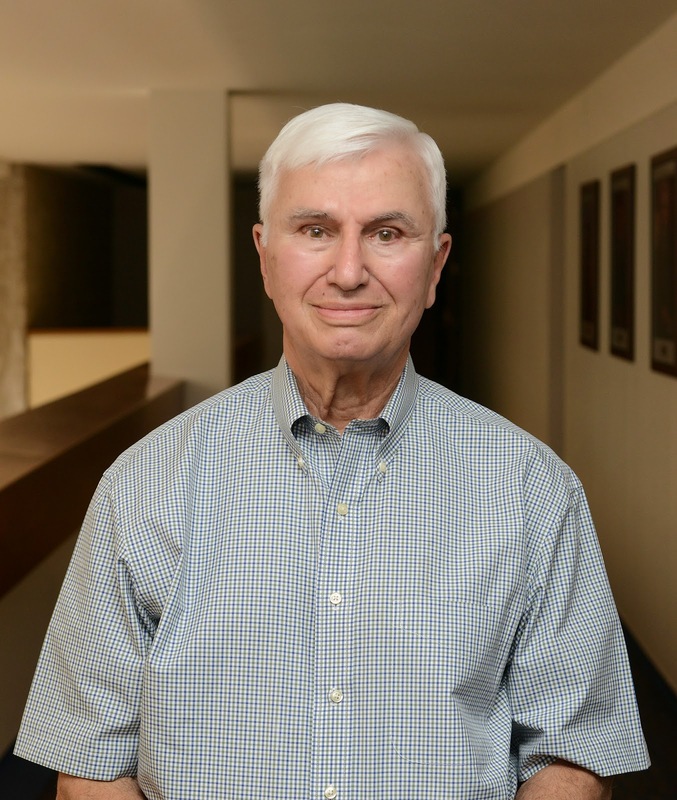 Kent Redfield, emeritus professor of political science at the University of Illinois Springfield, was awarded the Illinoisan of the Year award at the Illinois News Broadcasters Association (INBA) fall conference on Oct. 4 in Marion. 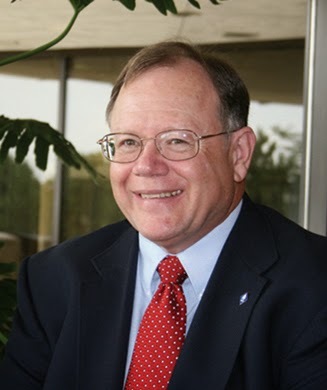 Redfield was voted by past presidents of the INBA as Illinoisan of the Year in honor of his contributions as a political scientist at UIS and his work with the Sunshine Project, a political campaign finance research project. Redfield is a frequent contributor to news stories on Illinois politics, and a well-known presence in Springfield. He delivered a keynote address at the award ceremony. Redfield has been engaged in research on the financing of political campaigns in Illinois and political ethics since 1991. The results of that research have been presented in numerous research reports, a series of articles in Illinois Issues, a 1994 book on financing legislative elections in Illinois, which is entitled Cash Clout and a 2001 book on the role of money in Illinois politics entitled Money Counts. Redfield has been director of the Sunshine Project since 1997. The project focuses on the role of money in politics, particularly in Illinois. The extensive databases and analysis of campaign finance in Illinois produced by the project can be accessed on the website of the Illinois Campaign for Political Reform at www.ilcampaign.org. Past recipients of the Illinoisans of the Year award include Attorney General Lisa Madigan (2011), Governor Jim Edgar (2009) and former press secretary and director of the Paul Simon Institute, Mike Lawrence (2008). Other winners include U.S. Attorney Patrick Fitzgerald (2006), State Representative Barbara Flynn Currie (2001), Senator Paul Simon (1995), and economists Saul Bellow and Milton Friedman (1977). Growing up in Chicago, Dominique Wilson never expected to travel half way around the world, let alone leave a lasting impact on a school in West Africa. This past summer, the junior communication major traveled to The Gambia, Africa with a group of students from the University of Illinois Springfield. They collected shoes, toothpaste, supplies, and financial donations to help children in the region. Wilson made it his mission to “pay it forward” with additional funds he had left paying for two children to attend school for the next 5 years. The school was so touched by his donations that they built a pavilion and named it in honor of him. “I am blessed to have such an honor, to have a building named after me,” said Wilson. The trip has inspired Wilson to become an educator and hopefully one day change education policy around the world. For now, he has some simple advice. “What I suggest for each and every one of you is do something, at least one thing in a focused effort, to make a difference,” he said. 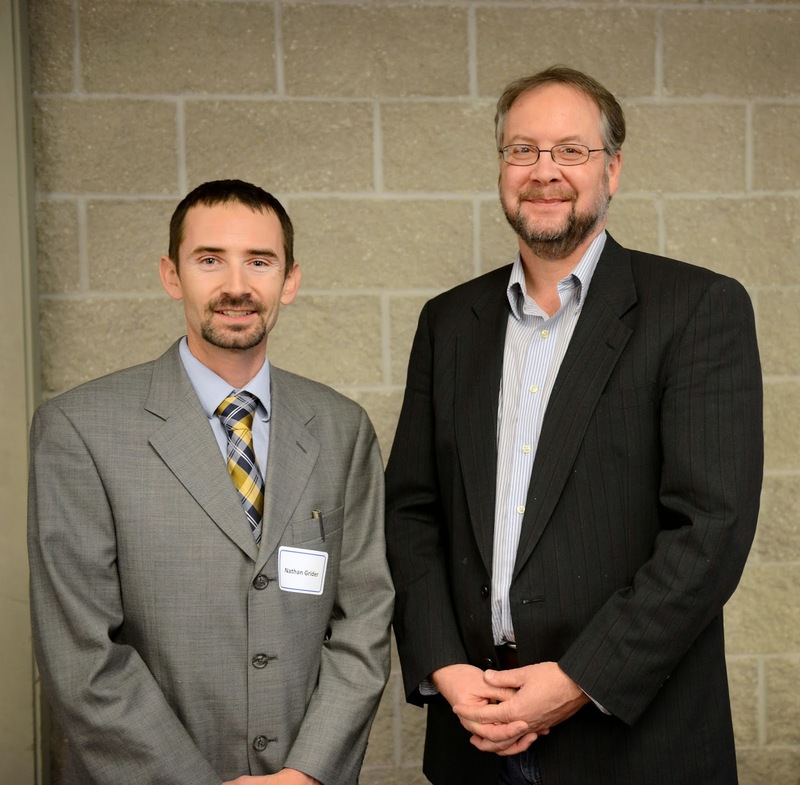 David Bertaina, associate professor of History at the University of Illinois Springfield, has been named University Scholar for 2014. 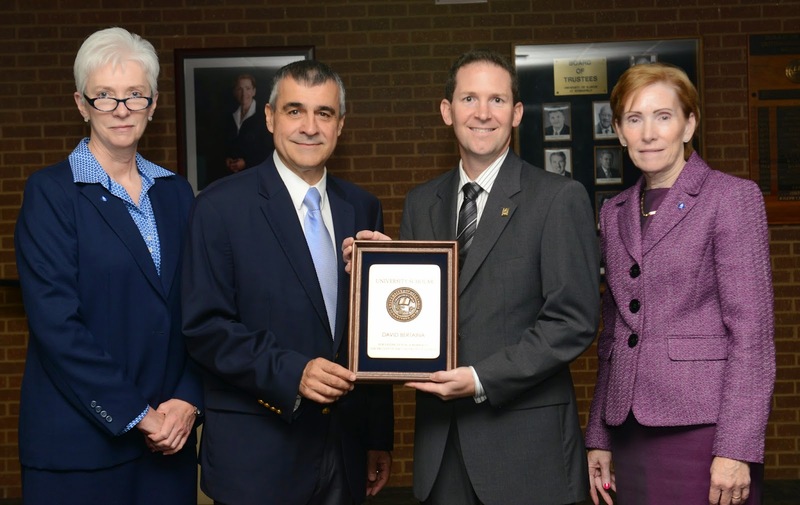 The award, considered the university’s highest faculty honor, recognizes outstanding teaching and scholarship. Only one faculty member receives the annual award at UIS. Bertaina has been recognized for his expertise in Middle Eastern religious literature and in Muslim-Christian interactions during the Late Antique and Medieval periods. He is currently conducting research on the Arabic writings of a medieval Muslim convert to Coptic Christianity, in preparation for a new book, titled Apostasy and Conversion in Medieval Egypt: Bulus ibn Raja on Islam. “Colleagues in the field have praised him for the very high quality of his research and the groundbreaking nature of his contributions to Islamic Studies,” said Pardie. He has published a monograph and an extensive array of book chapters, peer-reviewed articles in leading journals, book reviews, encyclopedia entries, and translations. He has also presented numerous papers at international and national academic conferences in his field. At UIS, Bertaina teaches courses at all levels of the curriculum, including core methods and capstone courses, as well as electives within the History major and general education curriculum. 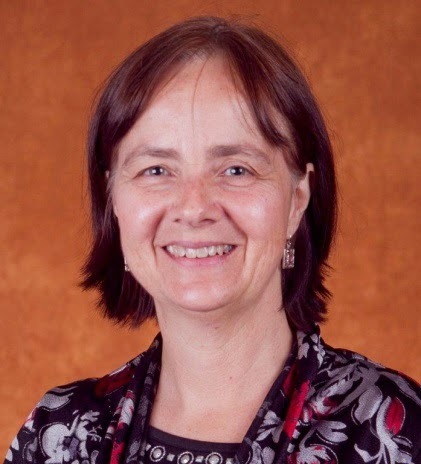 “It is also noteworthy that Professor Bertaina teaches very successfully in online as well as on-campus modes of course delivery, enlivening the learning process by incorporating multifaceted experiential learning activities, the creative use of multimedia, and course-relevant travel abroad into his courses. He is an outstanding example of the teacher-scholar ideal,” said Pardie. Bertaina is a member of the American Academy of Religion, the American Oriental Society, the North American Society for Christian Arabic Studies, and the Society of Biblical Literature. He obtained his doctorate in Semitic Languages and Literatures from The Catholic University of America. 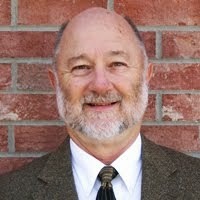 He taught at California State University at Chico before coming to UIS in 2007. As University Scholar, he will receive $15,000 a year for three years to support research and other scholarly activities. Faculty do not apply for this award; they are nominated by their peers. A committee of senior faculty makes the final selection. For more information on the award, contact Derek Schnapp, director of public relations at 217/206-6716 or email dschn3@uis.edu. Manuel Gomez, a business administration and global studies major, chose the University of Illinois Springfield because of the personalized attention he receives on and off the field. The UIS Prairie Stars men’s soccer player is a first generation college student who’s passionate about the environment. He’s a recycling advocate who is currently doing research on Hispanics and the environment. After he graduates from UIS, he’d like to earn his master’s degree in environmental studies and eventually work for the Environmental Protection Agency. “I picked UIS because of the size of the campus. It’s really small, which provides a one-on-one connection with my professors,” said Gomez. Gomez has been playing soccer since he was 5 or 6 years old. For the past three years, the Collinsville, Illinois native has been a forward on the men’s soccer team. It’s taught him many lessons about leadership. “Time management is one of the many things I learned here at UIS and just (to) be ready for everything, said Gomez. Gomez is busy on campus, also serving as an International Student Ambassador and a member of the Organization of Latin American Students (OLAS). “I feel like the atmosphere is good for me. It’s a great atmosphere overall (at UIS),” said Gomez. 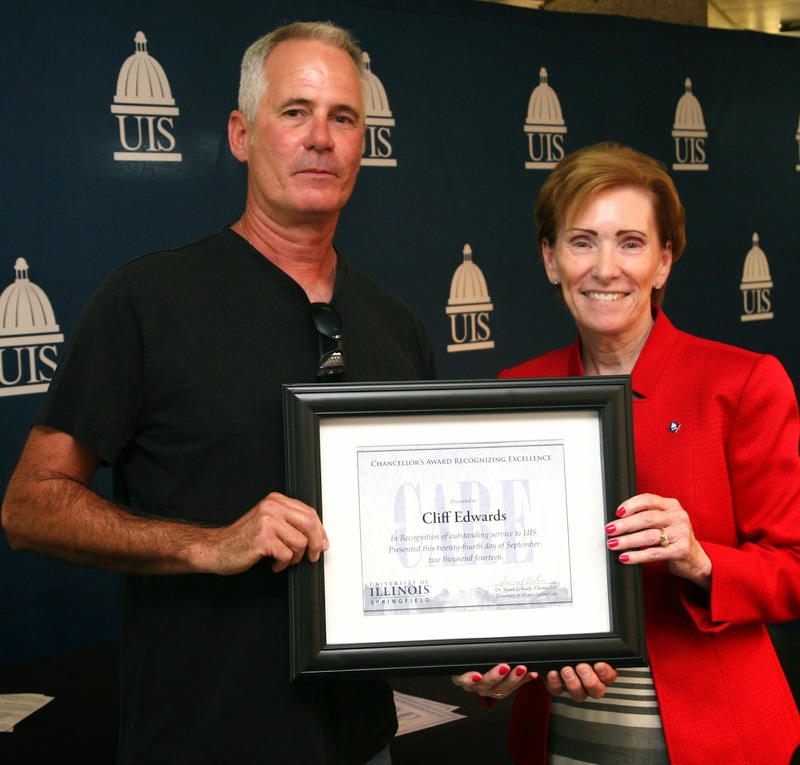 Cliff Edwards, a grounds worker at the University of Illinois Springfield, has been awarded the 2014 Chancellor’s Award to Recognize Excellence in Civil Service (CARE). The award is the highest honor annually awarded to a Civil Service staff member. 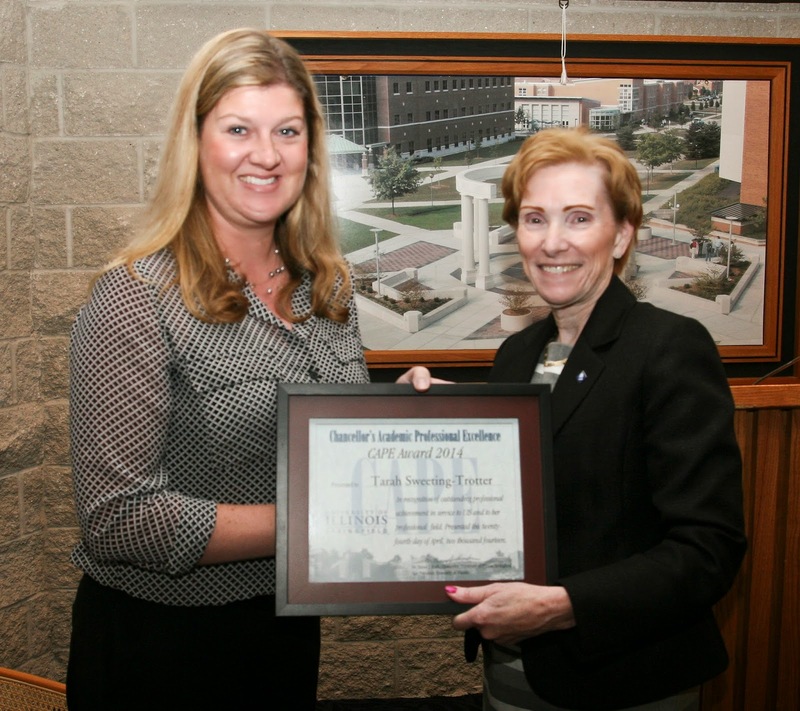 Chancellor Susan J. Koch presented the award during a luncheon on September 24, 2014. She also thanked all civil service staff members for their dedication to UIS. Edwards has worked on the grounds crew for more than 9 years. His goal is to make campus even more attractive for students, faculty, staff and visitors. Edwards’ co-workers call him a hard worker. He’s taken on several major projects, including placing more than 100,000 pounds of limestone boulders on a hillside near Brookens Library to help eliminate constant erosion problems. He also recently assisted in creating a waterfall and surrounding landscape near the campus pond. On campus, he’s known for his friendly attitude and willingness to help. He frequently answers questions from new students and visitors trying to find their way around campus. The CARE award was handed out as part of the 8th annual Civil Service Appreciation Day, which honors the over 300 civil service employees at UIS for all of their hard work and dedication. This year’s celebration included a variety of door prize drawings. University of Illinois Springfield associate professor and Human Services Department Chair Carolyn Peck, Ph.D., will be honored for her work in the field of aging with the Dorothy S. Kimball Award. The award from the Area Agency on Aging for Lincolnland will be presented at its annual meeting at noon on Thursday, September 25, 2014 at Southwind Park. The award has been established to honor individuals in 12 central Illinois counties for outstanding accomplishment in the field of aging or on behalf of older adults and/or family caregivers. Peck joined the UIS College of Education and Human Service in 2002 as an assistant professor. Her areas of teaching focus on Gerontology and end of life issues. She has conducted and published research on compassion fatigue in geriatric case managers with the Illinois Department of Aging. 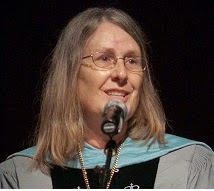 In 2010, she was the recipient of the UIS Faculty Excellence Award. For more information, please contact Angela Try in the UIS Office of Campus Relations at atry2@uis.edu or 217/206-6716. Music has always been a part of Kylie Gilmore’s life. Now that she’s in college, singing helps relieve some of the daily pressures she faces as a business administration major at the University of Illinois Springfield. Gilmore is a member of the UIS Choir and a Camerata Scholarship recipient, a $10,000 performance scholarship for non-music majors that is renewable for 4 years. As a business administration major, she’s often asked why she didn’t major in music. She dreams about landing a job as a marketing consultant for a theatre company or music label, which would allow her to combine her love of business and the fine arts. For now, she’s busy performing on campus and learning from every minute. Outside of choir, Gilmore is vice chair of finance and co-sponsorship for the Student Activities Committee, which plans events on campus. This past summer she was a student orientation leader and a Summer Bridge Program mentor. “Every single thing that I do is giving me experience for the future and is helping me become a better leader,” said Gilmore. She knows she’ll need more than a degree to land a job following graduation. “We’re going to need experience, so that is why I love absolutely everything I do,” she said. 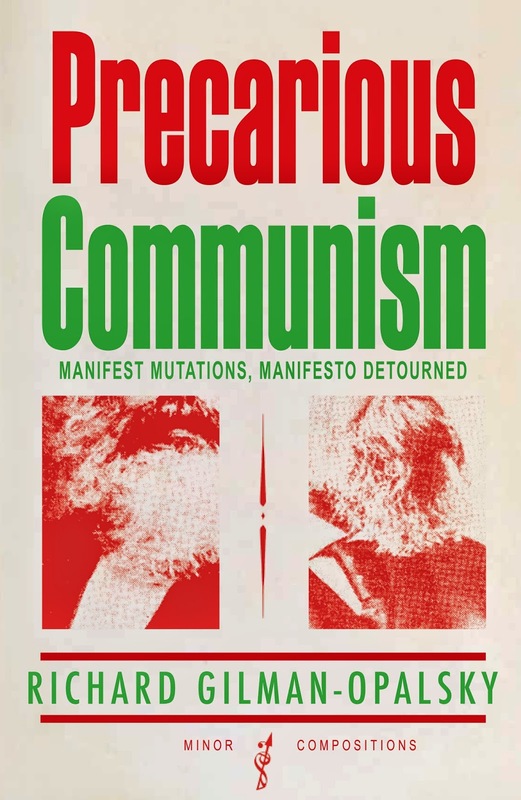 Richard Gilman-Opalsky, associate professor of political philosophy in the Department of Political Science at the University of Illinois Springfield, has published a new book titled Precarious Communism: Manifest Mutations, Manifesto Detourned. Precarious Communism is a book-length study of Karl Marx and Frederick Engels' The Communist Manifesto of 1848. In Precarious Communism, Gilman-Opalsky critically considers the enduring relevance of the most famous political manifesto ever written. He argues that, only in the absence of ideological reaction to the original manifesto, can we assess where Marx was right and wrong in his analysis of capitalism, history, and revolution. To accomplish this work, Gilman-Opalsky applies a methodology known as "détournement." Détournement has typically been used by artists and activists to repurpose existing materials in text and image to make them say something else. In Precarious Communism, Gilman-Opalsky performs a book-length détournement of The Communist Manifesto, which means that he reads and rethinks the original text line by line, in light of 165 years of political history and philosophy. This process allows Gilman-Opalsky to explore the ongoing applicability of The Communist Manifesto, as well as its failures, from within the form and content of the original. Precarious Communism is a book that rethinks Marx and Marxism in relation to capitalism and evolving social, political, and economic crises today. Partially as a result of its methodology, Gilman-Opalsky’s new book reads like a mutant manifesto of its own, which argues that communism in the 21st century must be understood and theorized as precarious communism. The book was published by Autonomedia/Minor Compositions and can be purchased online at Amazon.com or directly from the publisher’s website. 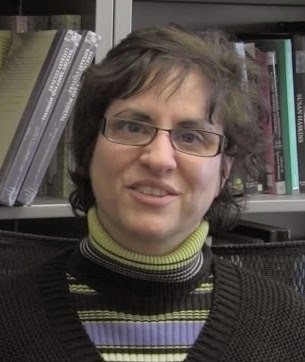 Gilman-Opalsky has authored two other books, Spectacular Capitalism: Guy Debord and the Practice of Radical Philosophy (2011) and Unbounded Publics: Transgressive Public Spheres, Zapatismo, and Political Theory (2008). Three students from the University of Illinois Springfield have been awarded Avery Brundage Scholarships for excellence in academics and athletics. Each winner will receive a $2,500 award for the 2014-2015 academic year. The recipients are Falyn Lockenour of New Berlin, Ill., a psychology major and women’s soccer player; Paige Polonus of Plainfield, Ill., a biology major and women’s soccer player; and Rebbecca Ramirez of Springfield, Ill., a psychology major and member of the women’s golf team. The Avery Brundage Scholarship Fund Committee, composed of nine representatives from the faculties and student bodies of the Chicago, Springfield and Urbana-Champaign campuses, selects students from each U of I campus who engage in athletics for personal development, not as preparation for professional sports. In addition, the students must be working toward bachelors, masters or doctoral degrees at the U of I and must be in the upper 25 percent of their undergraduate class or in good academic standing in their graduate program. The scholarship program was established in 1974 by an endowment from Avery Brundage, University of Illinois alumnus and former president of the International and U.S. Olympic committees. For more information, contact Tim Gilles, scholarship coordinator for University-wide Student Programs at 217/333-1171. The University of Illinois Springfield held its annual Faculty Honors Reception on Tuesday, May 6, 2014. Chancellor Susan J. Koch and Vice Chancellor for Academic Affairs and Provost Lynn Pardie presided over the ceremony honoring faculty members who have received tenure and/or promotion, been awarded sabbaticals, or granted emerita/emeritus status. Four major awards – the Faculty Excellence Award, the Pearson Faculty Award, the Spencer Faculty Service Award, and the Oakley Distinguished Online Teaching Award -- were also presented. The Faculty Excellence Award was presented to Leonard Branson, professor of Accountancy. The award recognizes mid and late career colleagues who best exemplify the ideal of the teacher-scholar and whom the faculty recognizes as role models, based on sustained accomplishments in teaching and scholarship at the University of Illinois Springfield. 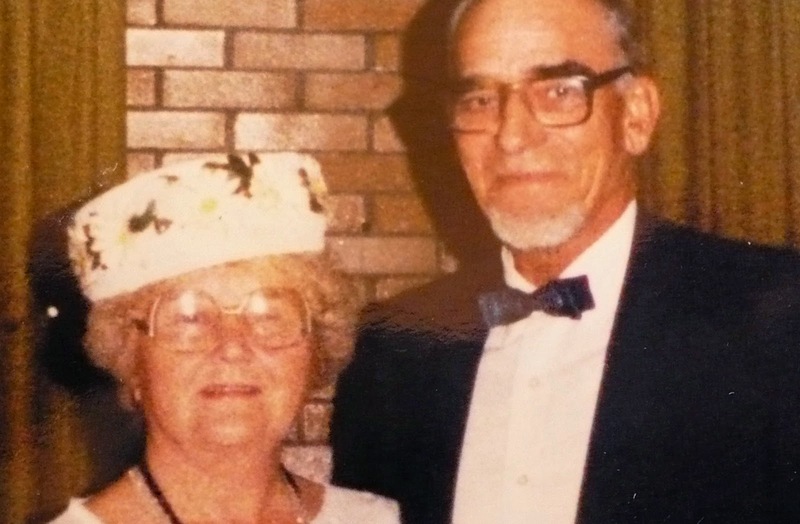 The award is funded through the generosity of Wilbur and Margaret Wepner. Professor Branson is recognized by his colleagues as one of the most effective and well-respected faculty in the College of Business & Management. His courses are known as being both challenging and engaging for students, and he has developed a number of innovative active learning exercises and team-based approaches to help students bridge the potential gap between classroom learning and real world applications. The Pearson Faculty Award for outstanding teaching was presented to Donna Bussell, associate professor of English. The award recognizes a faculty member whose performance exemplifies our commitment to excellence in teaching and who stands among the very best teachers at the University of Illinois Springfield. Such a teacher both informs and inspires students, giving them the knowledge and values with which they may become productive and enlightened citizens. The award was established by a gift from Dr. Emmet and Mary Pearson, longtime benefactors of the campus. Bussell teaches at every level of the curriculum and also teaches in both on-ground and online modes of delivery. She actively engages in academic advising and in the mentoring of student scholarship outside the classroom. Her courses are writing-intensive and require students to engage in careful analysis of challenging works. “It is clear that Dr. Bussell understands and honors the importance of student-centered teaching, and it is a testament to her interest and expertise in teaching that she manages so skillfully to challenge and support her students in good measures,” said Chancellor Koch. The Spencer Faculty Service Award was given to Beverly Bunch, professor of public administration. Honoring Robert Spencer, founding president of Sangamon State University, this award recognizes faculty who best exemplify the ideal of the “professor-citizen” through public service and service to the academic community. Bunch’s philosophy of service indicates that she values being able to use her professional strengths to benefit communities. Her contributions to university service have included valuable work at department, center, and campus levels, and she has also provided extensive service to her profession and to the external community. She has delivered training on budgeting for governmental and nonprofit organizations for public managers, county, treasurers, and city clerks. She has also applied her professional expertise to assist a number of community agencies with annual reporting requirements, research projects, program evaluations, and strategic planning. Bunch also serves on a community fund allocation panel for the United Way of Central Illinois. “As you can see, Professor Bunch truly exemplifies the ‘teacher-citizen’ envisioned by our founding president,” said Chancellor Koch. 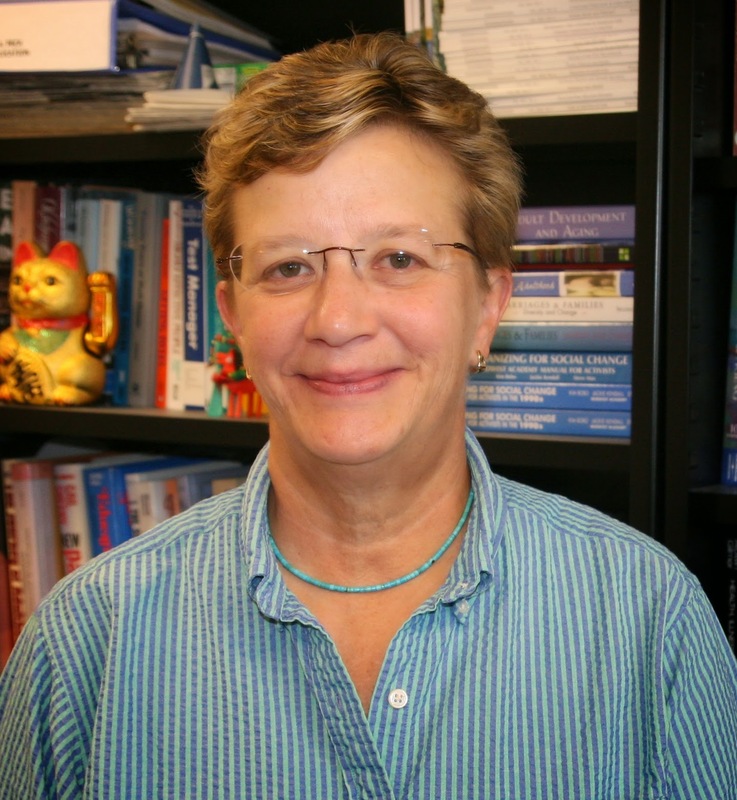 Karen Swan, the James J. Stukel Distinguished Professor of Educational Leadership, was honored with the Burks Oakley II Distinguished Online Teaching Award. The award was established by Burks Oakley II, who helped launch UIS’ online programs. The Oakley Award recognizes UIS faculty members whose performance exemplifies the institution’s commitment to excellence in online teaching. Professor Swan’s extensive record of scholarship represents well the teacher-scholar model that we value at UIS. Her research focuses directly on teaching and learning processes, and she is well-respected for the high quality of her work. She has received numerous awards and grants in support of her research agenda and serves as an expert consultant in online education. Recommended for tenure and promotion to associate professor were Layne Morsch, Chemistry; Frances Shen, Psychology; and Denise Sommers, Human Services. Scott Day, Educational Leadership, was recommended for promotion to full professor. Receiving the designation of emerita/emeritus faculty were Kathryn Eisenhart, Donald Morris, Stephen Schwark and William Siles. Sabbatical leaves were granted to Peter Boltuc, Lynn Fisher, Eric Hadley-Ives, Kathy Jamison, Amy McEuen, Dennis Ruez, Frances Shen, and Milissa Thibodeaux-Thompson. Patricia Byrnes, Economics, and Ann Strahle, Communication, were named China Faculty Exchange Fellows. All promotion, tenure, sabbatical leave, and emerita/emeritus status recommendations are subject to approval by the University of Illinois Board of Trustees. The University of Illinois Foundation today announces Cullom Davis, professor emeritus of history at the University of Illinois Springfield, as the winner of the 2014 William E. Winter Award for Outstanding Advocate Leadership. The award will be presented at the UIS Celebration of Philanthropy on May 20, 2014. The U of I Foundation is the fundraising arm of the University of Illinois and its three campuses. The William E. Winter Award, named for the CEO Emeritus of the 7-Up Company and a longtime member of the University of Illinois Foundation Board of Directors, celebrates individuals who play active roles in securing private support for the University of Illinois. Davis is a founding faculty member of Sangamon State University (now UIS). A strong campus advocate and fundraiser, he brought significant gifts to UIS for Brookens Library, the Papers of Abraham Lincoln, WUIS, and other programs. "It has been my privilege to serve and then support the University of Illinois Springfield," said Davis. "Present at its origins (as SSU) in 1970, I embraced the student-centered education, the public affairs mission, and its early determination to make Brookens Library the physical and intellectual center of our campus. Whatever I have accomplished pales in comparison with the rewards I have enjoyed." While a professor, Davis created and directed the University's Oral History Office and helped design its M.A. program in public history. Following his retirement from teaching in 1995, he continued serving as director and senior editor of the Lincoln Legal Papers (which later became the Papers of Abraham Lincoln), a position he held from 1988 to 2000. Past recipients of the William E. Winter Award include Bob Clary, Leonard Branson, Thom Serafin, Tom Marantz, Julie Kellner, Guerry L. Suggs and Michelle M. Suggs (deceased); Howard C. Humphrey (deceased), James Lundquist (deceased), and Clifford L. Greenwalt. For more information, contact Jeff Lorber at 217/206-7822 or jlorber@uis.edu. The Kappa Delta Pi International Honor Society in Education chapter at the University of Illinois Springfield inducted six new members during a ceremony on May 3, 2014. Kappa Delta Pi recognizes scholarship and excellence in education. Teacher candidates initiated in the honor society, which represents the top twenty percent of educators, were Erin Clinch of Glasford, Kelly Fitch of Peoria, Davina Frazier of Dunlap, Amy Hemphill of Beardstown, Scott Summers of Waverly, and Laura Zulauf of Springfield. Dr. Traci Van Prooyen, assistant professor of Teacher Education at UIS, conducted the ceremony. Kappa Delta Pi, established in 1911, fosters excellence in education and promotes fellowship among those dedicated to teaching. It is comprised of 600 chapters and more than 40,000 members. Dr. Jennifer Gill, the new superintendent of Springfield Public School District 186 was the guest speaker for this year’s event. Teacher Education is a department in the College of Education and Human Services at UIS. The Department currently offers licensure in teaching at the elementary level as well as teaching at the secondary level in the areas of English, mathematics, chemistry, biology, history, political science, and sociology/anthropology. For more information about the honor society and recipients, contact Traci Van Prooyen at 217/206-8532 or tvanp2@uis.edu. As a freshman, Stephen Salvador never thought he’d be working with real world samples in a college laboratory. He’s getting that opportunity at the University of Illinois Springfield. For five weeks, students got hands-on experience working with various types of rock ore to extract the chemical element copper. The students treated the experiment as if they were running a copper mining operation. “We push them to think like scientists, we engage them in the laboratory to get them to think about what they’re doing,” said Keenan Dungey, UIS associate professor of chemistry. Angelica Adduru, a non-degree seeking student, took the General Chemistry 2 course to prepare for medical school. The hands-on laboratory taught her how to work as part of a team. “I learned how to deal with other people, because this is the first lab we actually had to work with a group of students,” she said. Dungey says it’s important for students to engage in hands-on research because it teaches them analytical reasoning, critical thinking, and communication skills. “Here in lab they can actually take those concepts (that they learn in the classroom) and apply them to a real world problem,” said Dungey. Tarah Sweeting-Trotter, an undergraduate academic advisor at the University of Illinois Springfield, was honored with the 11th annual Chancellor's Academic Professional Excellence Award (CAPE) on April 24, 2014. Sweeting-Trotter, along with Karen Moranski, associate vice chancellor for undergraduate education, created the Students Transitioning for Academic Retention and Success (STARS) Living Learning Community at UIS. The program helps select freshmen by offering them enhanced academic support services to help ensure success at UIS. She’s also helped to create and implement two summer bridge programs for freshmen and sophomore students and a peer advising program. She offers Faculty Development workshops to promote faculty advising, among many other projects. Sweeting-Trotter has presented at several national advising conferences and recently earned her Ph.D. in English from St. Louis University. She teaches in both the Sociology/Anthropology and Women and Gender Studies departments at UIS. The CAPE Award recognizes U of I academic professionals for their efforts in three general categories: work projects, professional development and affiliations, and contributions to their units. The winner receives $500 in cash for personal use, and another $500 is given to the winner’s department. All academic professionals are eligible to receive the CAPE Award; nominations are reviewed by campus committees and candidates' names are forwarded to the chancellor, who makes the final selections. Others nominated for the 2014 CAPE Award include Jeannie Capranica, Sean Crawford, Rachel Lattimore, Kathryn Kleeman Lesniak, Tulio Llosa, Kara McElwrath, Kerry Poynter, Christina Ryan, Natalie Taylor, and Lisa Whelpley. Riley Kerestes, a graduate student in the MBA program at the University of Illinois Springfield, has been awarded a $12,000 fellowship from FMC Technologies Inc. for the 2014-15 academic year. Kerestes, a Dunlap, Ill. resident, takes classes at the UIS Peoria Center. The UIS Peoria MBA format is designed to meet the needs of students who are employed fulltime, but wish to complete degree requirements in a timely manner. Courses are offered so that it is possible for students to complete degree requirements in less than two years. The fellowship program honors outstanding graduate students in business administration, economics, engineering, finance or related fields. Final selections are made by representatives from FMC Technologies, the University of Illinois, and the U of I Foundation. Applicants are required to submit a background essay describing their achievements as a graduate student, as well as three letters of reference, and official transcripts. Faculty members nominate students for consideration. The FMC Educational Fund (formerly the Link-Belt Educational Fund) was established in 1963 by U of I alumnus Bert A. Gayman, who generously donated 10,000 shares of stock to the University of Illinois Foundation. For more information, contact Professor Ranjan Karri, interim director of the MBA Program, at rkarr2@uis.edu or 217/206-7917. The University of Illinois Springfield has awarded two business students with the Wayne and Margie Fox Award for Excellence. The honor is given to students who demonstrate excellence in an unpaid internship with a Springfield area not-for-profit organization. Jill Gossett of Springfield recently finished an internship with District 23 Mercantile & Foundry, a non-profit store that raises money for the Cochlear Implant Awareness Foundation. John Howard of Peoria interned with the Springfield Community Federation, a non-profit which strives to improve the lives and life outcomes of disadvantaged single adults, families, and children in central Illinois. As part of the award, each student was presented with a check for $1,250. The award was made possible by Wayne and Margie Fox and recognizes the significant time the students commit to their unpaid internships. For more information, contact Dyanne Ferk, associate dean of the College of Business and Management, at 217/206-7929 or dferk1@uis.edu. The University of Illinois Springfield Beta Gamma Sigma Honor Society chapter inducted 64 College of Business and Management students during a ceremony on April 12, 2014 in Brookens Auditorium. Sarah Phalen, President and CEO of Illinois National Bank, was also inducted as an honorary member. Beta Gamma Sigma is the international honor society serving business programs accredited by the Association to Advance Collegiate Schools of Business (AACSB International). Membership in Beta Gamma Sigma is the highest recognition a business student anywhere in the world can receive in a business program accredited by AACSB International. The society grants admission to the top 10 percent of the baccalaureate class and the top 20 percent of the graduate students. The mission of the society is to encourage and honor academic achievement in the study of business, to foster personal and professional excellence, to advance the values of the society, and to serve its lifelong members. For more information about the honor society and recipients, contact Jorge Villegas at 217/206-7972 or jvill2@uis.edu. Tyler Gansky knew there was a demand for a food delivery service in Springfield, so he took matters into his own hands. The University of Illinois Springfield business administration major started his own business called Abe’s Takeout. “We’ve contract out with 20 different restaurants to provide a delivery service for them outside of their own employees and insurance,” said Gansky. Through Abe’s Takeout, customers can place delivery orders from popular Springfield restaurants. Orders can be placed online or by telephone. Gansky came up with the idea for his business while attending a university in Columbia, Missouri. There he met the owners of four similar food delivery services in Columbia. That sparked his entrepreneurial idea to bring the service to Springfield. Once back in Springfield, Gansky decided he wanted to learn more about running a business, so he enrolled in the business administration program at UIS. Ganksy has been actively applying what he’s been learning in the classroom at UIS. Three months before he opened Abe’s Takeout he was busy building the back end of his business, hiring a webmaster to design a website, and hiring employees. “Here I find myself in this Management Information Systems course, which unbeknownst to me is exactly what I’m paying people to do,” said Gansky. He knows he made the right decision to pursue his education at UIS, because he’s learning in an environment with smaller class sizes and where professors know his name. “The classroom situations, the teacher relationships and the overall education experience that I’ve had at UIS is light years ahead of the other institutions I’ve been at,” said Gansky. For the first time, the University of Illinois Springfield is sending a contingent of seven students to present at the National Conference on Undergraduate Research April 3-5, 2014 at the University of Kentucky. Students were selected to submit abstracts from UIS in a competitive process by the Undergraduate Research Steering Committee. All seven students were accepted by the national conference committee. Jesse Britz, a chemistry major from Divernon, studied the use of iron nanoparticles for removing nitrate pollutants with professor Keenan Dungey. Nathan Hoyle of Jacksonville used geographic information systems to map tree diversity on campus with Environmental Studies professor Dennis Ruez. Wesley Hill, a psychology major from Decatur, worked with professor Carrie Switzer to study the spread of urban legends. Sophia Pham, a chemistry major from Chicago, working with biology professor Hua Chen, studied the greenhouse gases at Emiquon. Two students will present from the research group of professor Frances Shen in psychology. Brittany Sievers of South Jacksonville studied the role of religious commitment in college student stress. Brianna Werner of Carrollton studied the perceptions of the college experience by veterans. Nicholas Decker, a biology major from Peru, Ill. explored enzyme inhibitors with chemistry professor Layne Morsch. The 28th annual National Conference on Undergraduate Research is a program of the Council on Undergraduate Research. Around 4,000 students from around the country will present their research and creative activities. UIS is an institutional member of CUR. The students will be accompanied by Keenan Dungey, director of the Undergraduate Research Support Program, which co-sponsored the students’ travel. Rachel Tohme, a graduate student in the Human Development Counseling program, will also participate in the trip. Further support was provided by a Student Life Conference Travel award. For more information, contact Keenan Dungey at 217/206-7345 or kdung1@uis.edu. Sarah Sagmoen, director of learning commons and user services at Brookens Library at the University of Illinois Springfield, has been selected as one of 50 “Movers and Shakers” in the annual award sponsored by Library Journal, the most prestigious trade journal in the library profession. More than 225 librarians from all types of libraries throughout the United States were nominated for the award which recognizes early career librarians who are seen as emerging leaders in the field. The 50 individuals chosen for the award this year will be profiled in the March 15 issue of Library Journal. That description certainly fits Sagmoen. Early on in her now four year career at Brookens Library, she began to think of new ways to reach out directly to students. Research performed by the library had shown that students were more likely to ask for assistance from librarians if they knew librarians as people. Sagmoen set out to make that happen. She began volunteering at student activities on campus, such as Springfest, where she judged the “monumentally muddy” tug-of-war. She was a key member of the library committee that planned and implemented gaming days and poetry slams, and together with colleagues in the library and Student Life, conceived of and worked with students to produce the successful “Haunted Library” event held each year. The first Haunted Library was voted “Student Event of the Year.” Sagmoen’s impact has not gone unnoticed on campus—she was chosen as an Employee of the Month in 2013. Sagmoen also took on more responsibility within the library, performing a variety of functions before being chosen in a national search for the newly created position of Director of Learning Commons and User Services. In this role, Sagmoen manages the Information Desk, Circulation, and Reserves as well as the installed base of over 100 public-use computers. She has created a successful training program for library student assistants that empowers them and prepares them to take on leadership roles. In addition to serving as the liaison to Student Life, Sagmoen, who is an assistant clinical professor, also is the library liaison to the College of Education and Human Services, offering information literacy instruction and doing collection development for the disciplines represented by EHS. 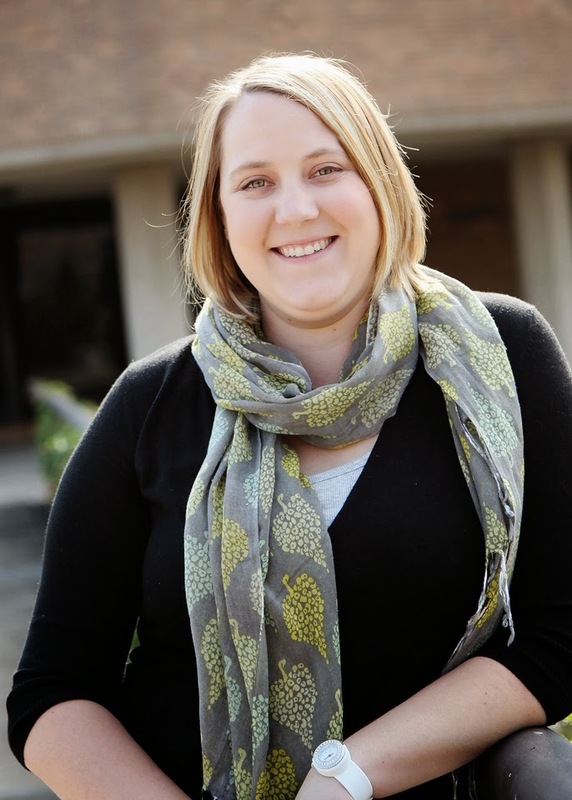 In her second year at UIS, Sagmoen was chosen as an instructor for ILEAD U (Illinois Librarians Explore, Apply and Discover), an Institute of Museum and Library Services Laura Bush 21st Century Librarian grant sponsored by the Illinois State Library. She was chosen for her social-networking skills, but her high-energy style of teaching and her ability to work with a wide array of people have meant that she has been asked to return in subsequent years. “Sarah’s accomplishments point to her creativity, her energy and enthusiasm, her ability to connect with people and inspire a team and her sheer capacity for hard work. She believes that libraries can be both educational and fun,” said Jane Treadwell, university librarian and dean of Library Instructional Services. Sagmoen, along with the rest of this year’s Movers & Shakers, will be honored at the American Library Association conference’s luncheon in Las Vegas on Friday, June 27, 2014. Journalists at WUIS, the public radio station of the University of Illinois Springfield, recently received four awards from the Illinois Associated Press. Statehouse Bureau Chief Amanda Vinicky won the second place award for best investigative report for her story “Judges’ Pensions”. Vinicky also won best sports report for her story “Rivals Help Tornado-Shattered Team.” WUIS Harvest Desk Editor Peter Gray won the second place sports award for his story on “Kids and Concussions”. WUIS Executive Editor Bill Wheelhouse won the first place award for best hard news feature for his story “Crop Insurance”. For more information about WUIS, visit their website at www.wuis.org. Several University of Illinois Springfield students were honored during the annual Model Illinois Government (MIG) simulation at the state capitol this weekend. The UIS delegation was also honored with the Outstanding Large Delegation award. Six students won individual awards for their involvement in MIG. Zachary Sullivan of East Moline was honored with the George Perry Award for Outstanding Contribution to MIG, Nate Marroquin of Chicago was named Outstanding Freshman Delegate, Jason Jenkins of Springfield was named Outstanding Lobbyist, Anna Mulch of Springfield was named Outstanding Member of the Senate, Garrie Allen of Peoria was named Outstanding House Committee Chair, and Nathan Piper of Springfield was named Outstanding House Committee Person. Additionally, several UIS students were elected to statewide office within the Model Illinois Government organization. Garrett McAlister of Matteson was elected governor, Nathan Piper of Springfield was elected president of the senate, Marc Reiter of Minonk was elected speaker of the house, Nathan Tarr of Springfield was elected attorney general, Ben Shafer of Springfield was elected treasurer, and Michelle Tuma of Elgin was elected chief justice. For more information, contact Michael Miller, UIS assistant professor of political science at 217/206-7220 or mmill24@uis.edu. On February 22, the University of Illinois Springfield Society for Human Resource Management (SHRM) Student Chapter competed at the Illinois State HR Games held at Northern Illinois University. This was the third year participating, but the first time as an official student SHRM chapter. This year UIS took six students to compete: Ashley Tague, Kim Tokarski, Hunter Westbrook, Geoff Piehl, Aerie Nguyen, and Ryan Steffen. The students competed in a Jeopardy style game in which both UIS teams made it to the semi-final round, and the two groups united into one team to compete in a case competition in which the group won first place against the University of Illinois at Urbana-Champaign, Illinois State University, and Northern Illinois University. The University of Illinois Springfield student newspaper, The Journal, brought home 13 awards at the 31st annual Illinois College Press Association conference on Feb. 21 and 22, 2014. 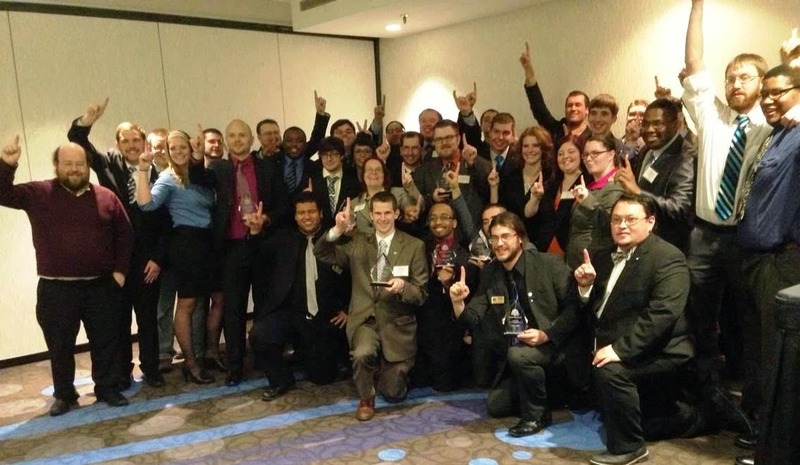 More than 30 Illinois colleges and universities competed in the annual competition. The Journal placed in categories across the board for writing, photography, cartoons, advertisements and design. The Journal competes in the “open” division with all participating schools and the “non-dailies” division with school enrollment more than 4,000. Content was submitted from regular news editions and from the once-a-semester magazine, Beyond. Illustrator Alex Johnson of Crystal Lake placed first in Editorial Cartoon for his piece titled “Waste,” which examined recycling issues on campus. Johnson’s bi-weekly comic strip, CAMPUIS, also placed first, in the Other Cartoon, Strip or Panel category. General Reporter Megan O’Dell of Decatur placed first in Feature Story for her piece titled “Transitioning to self-acceptance,” which detailed the journey of two transgendered women. Former Photographer Kim Hobby of Springfield placed first for Feature Photo for her depiction of the Springfield Special Olympics’ Polar Plunge. Hobby’s photo also received an honorable mention in the General News Photo category. News Editor and Photographer Brittany Henderson of Tinley Park placed second in Sports Photo for her piece titled “Prairie Stars hold off Knights.” Henderson also placed third in Feature Photo for her “demonstration of movement” in a photo of soccer player Chukwuka “Chuks” Iwe. Former News Editor Daymon Kiliman of Springfield placed third in News Story for his coverage of Radical Student Union protests at Campus Senate. Former News Editor Nafia Khan of Oak Park placed third in Feature Story for her piece titled “Wrap more than just a gift for your sweetheart this Valentine’s Day,” which looked at the rise of sexually transmitted infections in Sangamon County. Former Business Manager Kate Richardson of Taylorville placed third in Advertisement Less Than Full Page for her piece promoting LGBT Gospel Artist Justin Ryan. Former Layout and Design Editor Colten Bradford of Vermont received an honorable mention in Front Page Layout for consecutive editions Sept. 25, Oct. 2 and Oct. 9, 2013. The Journal Editorial Board received an honorable mention in Editorial for its editorial titled “SGA creates new senator, vote yes.” The piece urged students to “vote yes” for an international student senator seat on the SGA. For more information, contact Ashley Henry, The Journal Editor-in-Chief, at 217/206-6397 or journal@uis.edu. Michelle Tuma loves to apply what she’s learning in the classroom. At the University of Illinois Springfield, she’s been given that opportunity. The junior political science and legal studies major from Elgin chose UIS because of its location in the state capital and personal learning environment. Now she’s an intern with the Illinois Innocence Project where she’s working to help overturn the convictions of people she believes were wrongly convicted. Recently, she’s been reviewing testimony on the Pamela Jacobazzi case. Jacobazzi was convicted on the murder of an infant in her care in 1995. The conviction was based on a diagnosis of shaken baby syndrome, which scientists now question. In addition to working with the Innocence Project, Tuma is the head delegate of the UIS Model Illinois Government Organization. Each year the group spends a weekend at the state capitol debating policy with students from around the state. She was nominated for the position as a sophomore, which meant she often found herself leading graduate students with more experience. “It really taught me how to be a leader and gain people’s respect even if they’re older than me,” she said. Tuma is also vice president of the UIS College Democrats and an intramural sports supervisor at TRAC. “The best part about UIS is you can get involved in so many things because it is a small place that you can meet more people and learn more about these organizations and then get involved,” said Tuma. As she prepares to apply to law school, she feels confident in the education she’s received at UIS. “I feel I’ll be very prepared leaving UIS. I’m looking forward to law school,” she said. Dexter Burns had never left the United States before coming to the University of Illinois Springfield. However, that changed when the senior Global Studies major discovered the Study Abroad Program. Burns traveled to Peru for a summer and most recently spent a semester at the University of Colima in Mexico thanks to a partnership between the two universities. “This is something I really wanted to be able to do, to travel to a new country as a citizen of the world, instead of an American,” said Burns. The part of Mexico he visited has acquired a reputation of being unsafe for foreign visitors, however Burns always felt safe. “There were a lot of rumors about the insecurity of Mexico and a lot of worries about safety, but when I got there it was the total opposite,” he said. During his visit, he actively worked to fight the stereotype and was even interviewed by a local newspaper and television station. “(The reporter) came over and said ‘why don’t you come and tell the whole world because Mexico has such of a bad reputation’. That’s what the newspaper (article) is about. Not listening to the rumors, actually going to experience it yourself,” said Burns. For Burns, leadership means taking a stand. He wanted to experience the Mexican culture for himself and didn’t let rumors prevent him from traveling. “You’re able to just become a new person when you go there. There’s nothing like being submerged in the culture,” he said. Burns encourages other UIS students to take advantage of the opportunity to study abroad. “I definitely would encourage other people to study abroad. It’s one thing to read about a foreign country, it’s another thing to actually be there,” he said. Burns is an international student organization ambassador and is living in the International House on campus this year. Environmental Studies graduate student Chris Young of Springfield was presented with the University of Illinois Springfield’s Outstanding Master’s Thesis Award for the 2012-13 academic year during a reception on February 3, 2014 in the Public Affairs Center. Young’s thesis was entitled “Response of the Franklin’s Ground Squirrel to Recreational Trail Development in Springfield, Illinois.” Young is the outdoors news editor for The State Journal-Register newspaper. He was advised by Associate Professor Tih-Fen Ting. Graduate biology major Nathan Grider of Donnellson was presented with the Special Merit Award for his thesis entitled “Growth, Condition, and Diet of Alligator Gar (Atractosteus Spatula) Released in Merwin Preserve.” He was advised by Professor Michael Lemke. The following students received their departments’ Outstanding Thesis or Project Award for 2012-13 and were nominated for the UIS Outstanding Master’s Thesis/Project competition: Adam Bell of Naperville, Educational Leadership; Juanita Blanco of Champaign, Political Science; Kristen Chenoweth of Jacksonville, English; Ryan Nelson of Rockford, History; Blake Wood of Springfield, Communication. For more information, contact Derek Schnapp at 217/206-6716 or dschn3@uis.edu. 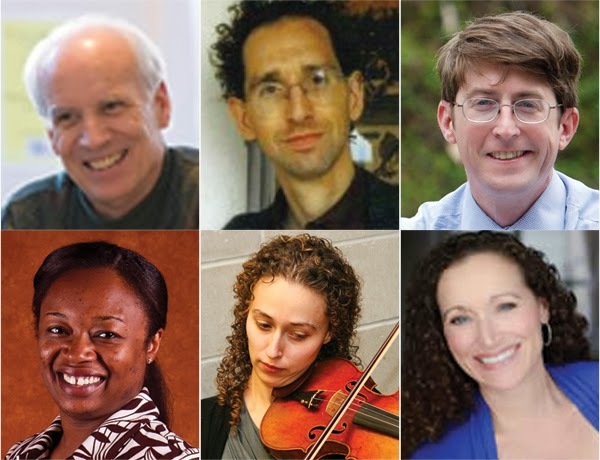 Several University of Illinois Springfield faculty members will be part of Fifth House Ensemble’s February 15, 2014 appearance at Sangamon Auditorium, UIS. Known for their innovative chamber music programs, Fifth House Ensemble has created a new performance event that considers the question, “What inspires you?” This multimedia event, unique to Sangamon Auditorium, incorporates presentations from UIS faculty in fields ranging from astronomy to fine arts. UIS faculty members collaborating on this project include Michael Burlingame, Ethan Lewis, John Martin, Tiffani Saunders, Yona Stamatis, and Missy Thibodeaux-Thompson. The scholars will share their own stories of inspiration and thoughts on how inspiration manifests itself in their individual fields. Intermixed with the presentations will be musical works by Astor Piazzolla, Philip Glass, and others, brought to life by piano, flute, oboe, and four strings. Fifth House Ensemble will also perform the Midwest premier of a national award winning composition by Charles Zoll. Join us as we reflect on the nature of inspiration and what drives people to become creative and passionate in their pursuits. Tickets are now on sale and can be purchased from the Sangamon Auditorium Box Office at 217/206-6160 or online at www.uis.edu/SangamonAuditorium/. Ticket prices are $21 for students and $39 for the public. 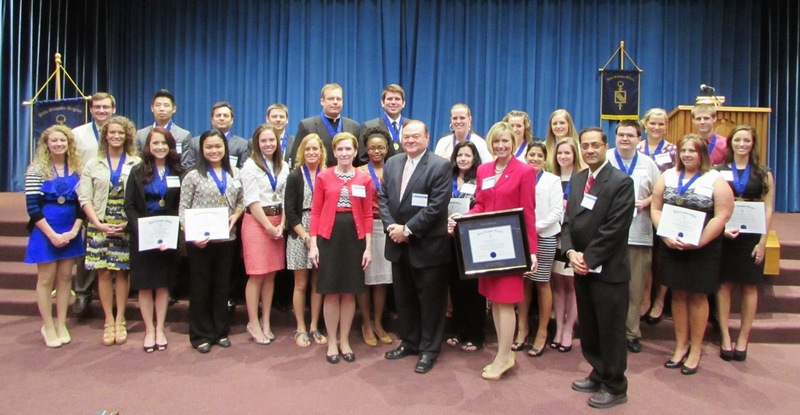 The University of Illinois Springfield Student Chapter of the Society for Human Resource Management (SHRM) inducted 13 members during a chartering ceremony on Saturday, February 1, 2014 on campus. Heidi Bruce of Virden; Kari Elliott of Macomb; Prerna Khullar of Bhadohi, India; Nhung (Aerie) Nguyen of Vietnam; Joan Ogwumike of Chicago; Geoff Piehl of Prospect Heights; Kerry Portillo-Lopez of Aurora; Joseph Schweickert of Peoria; Ryan Steffen of Springfield; Ashley Tague of Mt. Zion; Kim Tokarski of Hobart, Ind. ; Hunter Westbrook of Mehlville, Mo. ; and Samantha Willits of Clinton were inducted into the chapter. Ashley Tague was named president of the chapter, Kim Tokarski vice president, Hunter Westbrook secretary, and Geoff Piehl treasurer. The chapter is advised by UIS faculty member Donna Rogers, SPHR, instructor of management, and co-advised by Desiree Becker, Employment Specialist at HD Smith. 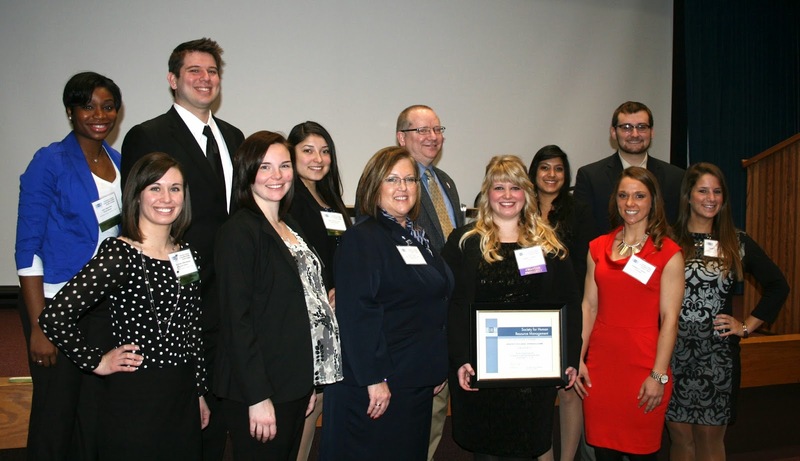 The UIS SHRM Student Chapter is the newest nationally recognized professional student organization on campus. 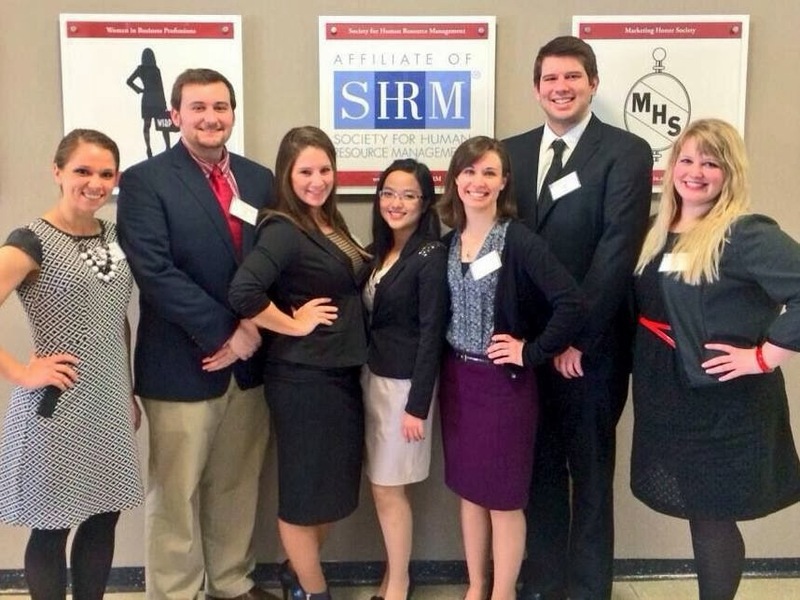 SHRM provides opportunities for students to network on the local level through student chapters. SHRM student chapters have regular meetings with programs designed to help members learn more about human resources (HR) and successful organizations. Meetings feature local leaders and HR professionals who provide insights about human resource issues in business, nonprofit and government. For more information on the UIS SHRM Student Chapter, contact Donna Rogers at 217/206-8264 or droge1@uis.edu.